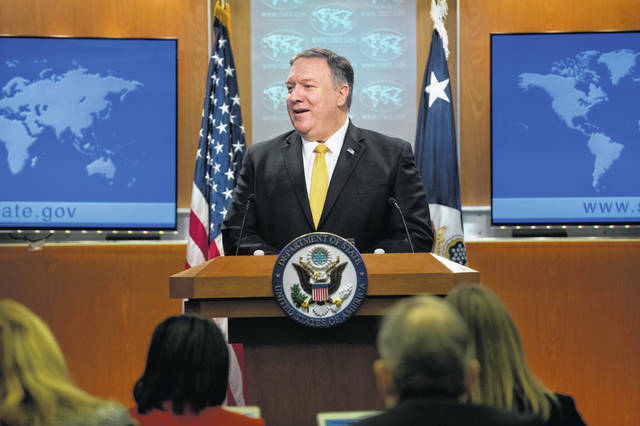 Secretary of State Mike Pompeo speaks at a news conference at the State Department in Washington, Friday, Feb. 1, 2019. Secretary of State Mike Pompeo has announced that the U.S. is pulling out of a treaty with Russia that’s been a centerpiece of arms control since the Cold War. Democrats in Congress and some arms control advocates criticized Trump’s decision as opening the door to an arms race. The Trump decision reflects his administration’s view that the arms treaty was an unacceptable obstacle to more forcefully confronting not only Russia but also China. China’s military has grown mightily since the treaty was signed, and the pact has prevented the U.S. from deploying weapons to counter some of those being developed in Beijing. Leaving the INF pact, however, risks aggravating relations with European allies, who share the administration’s view that Russia is violating the treaty but who have not endorsed a U.S. withdrawal. “I ‘congratulate’ the whole world; the United States has taken another step toward its destruction today,” said Konstantin Kosachev, head of the foreign affairs committee in Russia’s upper house of parliament. Trump said his administration will move forward with developing military response options. But senior Trump administration officials said they don’t expect any immediate testing or deployment of weapons that are banned under the treaty. The current Pentagon budget includes $48 million for research on potential military responses to the alleged Russian violations, but U.S. officials said the options do not include a nuclear missile.